More Snow? Screw TP! We Need Booze! You’ve probably heard about the crazy cold weather we’ve been experiencing this winter. I live in the “15 cases” region. Since I’m pregnant, this map makes me a little sad. I haven’t found a hot chocolate equivalent map. But we have ice cream and Girl Scout cookies, so we’ll be fine. Up until this point, the snow we’ve gotten has been manageable. Sure, the kids haven’t had a full week of school since Thanksgiving, but inchwise, we haven’t gotten more than 6-8 inches of snow with each storm. All of that changes today. I can no longer see the tires on Kiefer’s car. That’s how much we have right now, and it’s still coming down. How tall are Honda Accord tires? It means bread, milk, and TP will be worth more than gold for the next few days. What Is It With Mothers and Coats? Coworker: Make sure you’re bundled up because it’s cold enough that the baby can feel it. The baby has me as a coat. I think she’s fine. So here’s the deal: I hate wearing coats in the car. They make me feel confined. Plus…you can’t put your arms down. If I’m walking 30 feet to my car, I often don’t put a coat on. The same is true of exiting my car. Unless it’s super windy or snowing, I’m not wearing my coat to walk 30 feet to the building I work in. Put on your coat and gloves on. Put your coat on and put gloves in the pockets. Zip it up all the way! Where’s your coat? Why aren’t you wearing it? *You’ll notice there is no mention of hats. Hats were a lost cause. And that’s how I’ve rolled ever since. I may not be wearing a coat, but I always have one. Will I make the baby wear a coat? Of course. But not while she’s still in my tummy. That’s just overkill. Yesterday afternoon we heard we’d get 4-6 inches of snow today. Last night we heard 6-8 inches of snow. Kiefer: Since the snow won’t start until mid morning, you may end up going to school but getting released early. So be ready. Boo: Everybody wear their pajamas inside out tonight. That will guarantee no school or work tomorrow. Wear your clothes inside out if you want a snow day. Not backwards. Boo wore his pjs inside out. Radley wore his pjs inside out. Kiefer wore his pjs inside out. Guess who fell sleep wearing their pajamas right side out. Guess who the only person is who didn’t get out of school or work today. The other morning Ozzy and I got up while it was still dark outside. Actually…it’s always dark when Ozzy and I get up. I opened the door to let Ozzy outside. 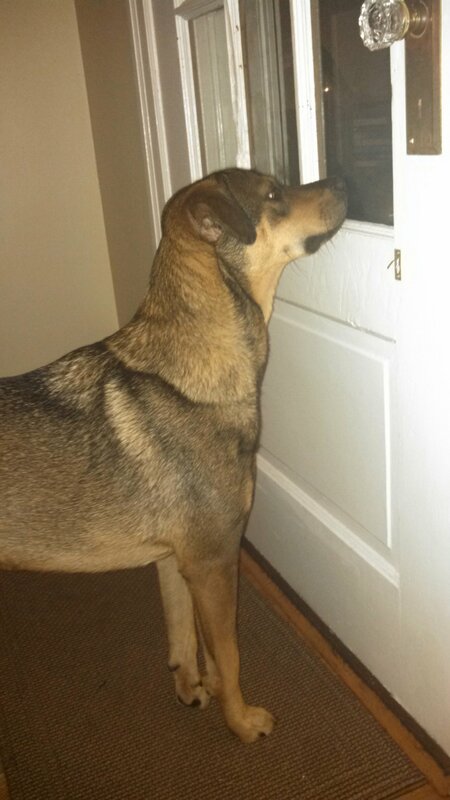 Instead of his usual mad dash for squirrels, he took one step and then froze (not literally) in the doorway. Open the door! The squirrels are getting away! I let go of the door and reached down to grab Esme. Unfortunately, that lined up my eye with the door handle. SMACK! Thoughtsy: Power through the pain! Must…get…black cat…before the darkness swallows her up whole. Thoughtsy: Screw the cat. She has fur for a reason. Ozzy will herd her home anyways. Ozzy Pups: ::after 5 steps:: Screw the cat. It’s even too cold for chasing. Esme: Freedom is cold. So very cold. And that’s when Esme ran back to the door and started pawing at it to be let in. Ozzy followed. 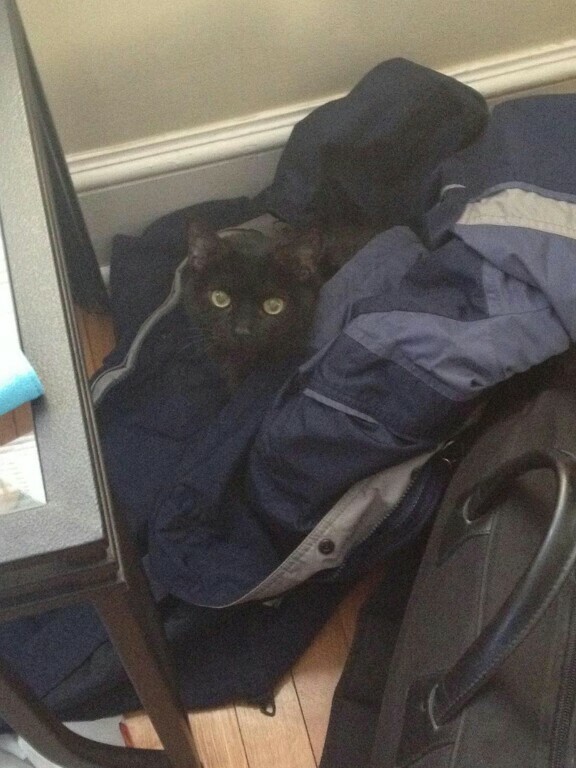 Esme: This coat is now mine. Get another. I’m gonna have a black eye. Do I put steak on it or frozen peas? What if I have a concussion? I shouldn’t go to sleep. WHAT IF I DON’T EVEN HAVE AN EYE ANYMORE?!?!?! The good news is I still have a fully functioning eye. The bad news is it looks like I’ve applied blue and purple eyeshadow to only one eye. I can’t wait it turns green. This week Ozzy and I spent a lot of quality time together walking in the snow. Every time we passed a snowman, he became cautious. He’d switch sides so he’d be between me and the snowman, and he’d walk next to me as he stared the snowman down. After we passed, he’d even throw back a glance or two to make sure we weren’t being followed. He didn’t discriminate either: lawn ornaments or snowman actually made of snow got the same treatment. The snowman had a tasty carrot nose. Ozzy watched the movie Jack Frost, which is about a killer snowman. But Ozzy actually lunged at the snowman. Luckily, the snowman was unharmed. Ozzy doesn’t have a mean bone in his body, so I’m sure he just wanted to play, but still…. So later that day, Ozzy and I played in the snow. He pranced in the snow and chased snowballs. 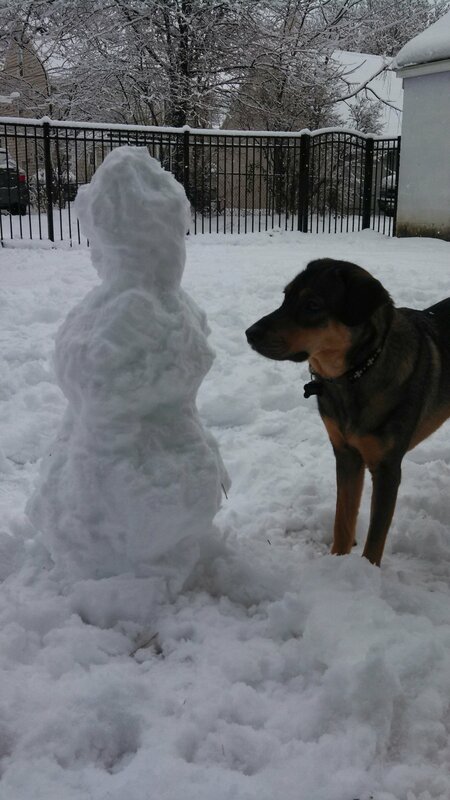 Then I decided to build a snowman for Ozzy to play with. 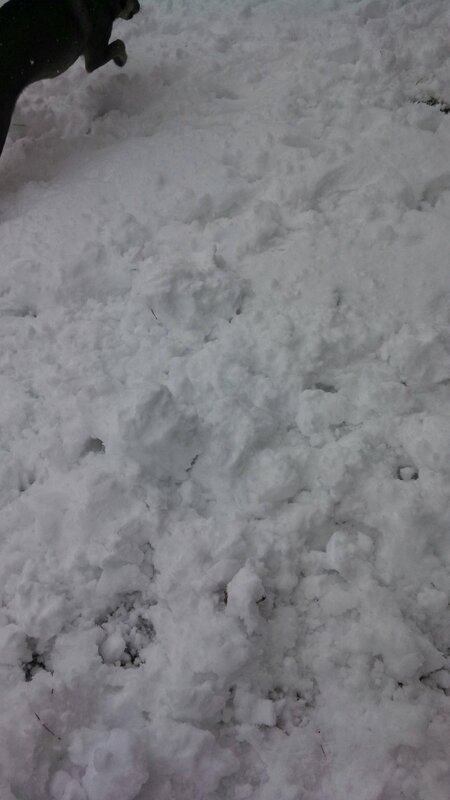 Do not play with snowballs and then build a snowman. Ozzy just assumed I was making giant snowballs for him to eat and crush. You can see Ozzy dashing off after crushing the snowball base. Jerk…. Only after Ozzy was sufficiently exhausted was a snowman allowed to stay. You’re only still here because I’m too tired to eat you. Tomorrow, you’re mine. Next Day Followup: I’m sad to report that the snowman you see above is no longer…although I suspect Radley was Ozzy’s accomplice in the demise.